Police are investigating the cause of a fire which has destroyed the heritage-listed Broadway Hotel in Woolloongabba, Brisbane. Emergency services were called to the building on Logan Road about 12.45am on Sunday by a bystander who heard an explosion. The hotel has been damaged by three separate fires over the past eight years which has forced the building's permanent closure. Police said no-one was injured and they have established a crime scene. Investigators spent Sunday combing through the scene for a cause of the fire, which broke out on the top storeys and collapsed the roof. “When I first arrived it was completely engulfed and the flames rising above the rooftop and the roof collapsed fairly quickly,” Sergeant Todd Sucic told reporters at the scene. A police spokesperson confirmed the fire was being treated as suspicious. The building is owned by Brisbane doctor Malcolm Nyst who has an agreement with embattled businessman Seb Monsour to develop the property subject to approval. Monsour is the brother-in-law of former Premier Campbell Newman. His company, Majella Property Developments, is currently facing $10 million in investment fraud charges related to payments from overseas investors in three investment funds. 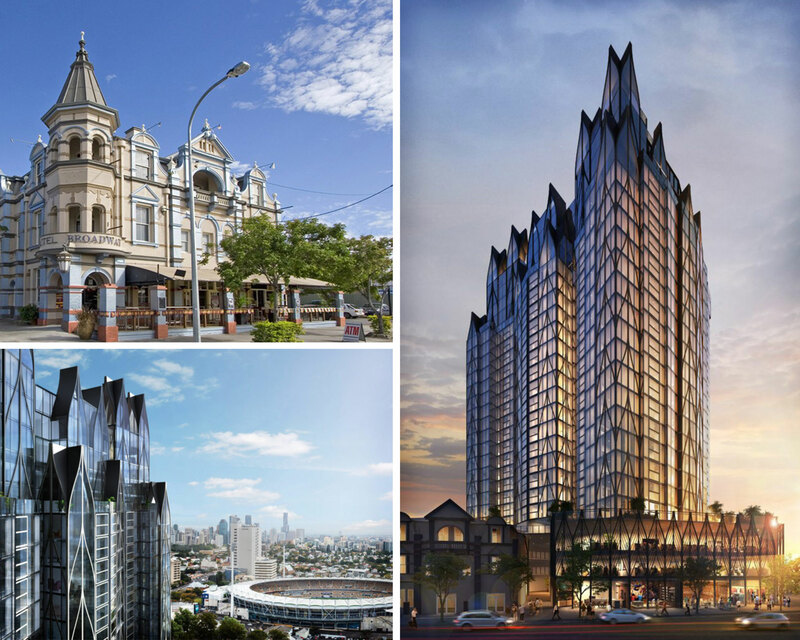 Majella lodged plans with Brisbane City Council last March to build a $260 million 27-storey tower on the corner of Logan Road and Balaclava Street. The company worked closely with heritage architect David Carter to assist with all design decisions. Majella's proposal included 262 apartments, with 379 car spaces, and 40 commercial spaces on the Logan Road site. The company scrapped its plans earlier this year to develop the historic hotel after objections from residents, heritage architects and community groups, who said the project threatened the historic hotel’s unique features. The Deputy Premier of Queensland called on Brisbane City Council to apply stringent conditions to any future development application on the site. “I think Queenslanders are sick of seeing heritage sites fall into disrepair or to be mysteriously burnt down overnight,” Trad said. The hotel was designed by prominent Brisbane architectural firm John Hall and Son, and built between 1889 and 1890. The building joined the Queensland Heritage Register in October, 1992.